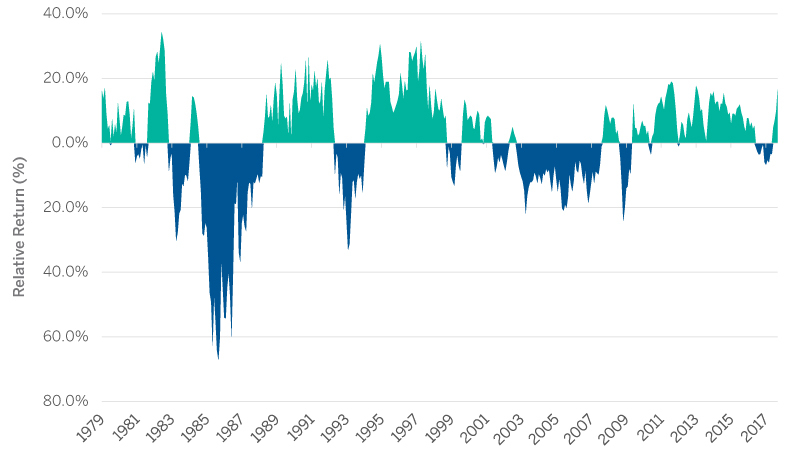 Recency bias is a powerful force, and it drives many smart people to assume that what they have seen recently is the “new normal.” But the truth is that the return differential between U.S. and non-U.S. stock has cycled back and forth regularly for many decades. There is no reason to expect that this cycle has ended, and/or that one side has somehow “won.” Moreover, despite persistent strength in U.S. markets ten years after the financial crisis, there are a number of fundamental factors supporting a “relative comeback” for both developed and emerging non-U.S. markets. Source: Bloomberg. U.S. equities are represented by the Russell 3000® Index. Non-U.S. equities are represented by the MSCI EAFE Index from 1979-1987, and the MSCI ACWI ex. U.S. Index from 1988-2018. In the 1980s, non-U.S. stocks were big winners over the U.S., as Japanese markets boomed and the U.S. “Black Monday” crash in 1987, among other factors, weighed on market returns. Then, in the 1990s, U.S. stocks benefited greatly from an internet-driven technology renaissance, while later in the decade non-U.S. markets were stung by the Asian Financial Crisis in 1997 and the Russian government debt default a year later. The 2000s were another period of broad outperformance for non-U.S. stocks, and as we’ve noted, U.S. stocks have reigned since the global financial crisis of 2008-09. We see here a general pattern of multiyear cycles when one “side” of this equation outperforms the other, and a series of boom and bust events that would have been difficult to predict in advance, but ended up benefiting or hurting one region over others in an outsized manner. None of this was easily predictable before it happened—and in truth, none of it offers much in the way of predictive value for us going forward. But we know that regional results have varied wildly over the years, and fortunes have shifted quickly. Against that backdrop, we think the best way to earn attractive returns while reducing risk is to diversify one’s portfolio across the globe. And by diversification, we mean balance in allocation less from quarter to quarter, or year to year, but rather over long periods, to balance when one region or the other struggles. However, diversifying blindly takes away one’s ability to make educated choices on markets that look fundamentally attractive. We strike a balance—we seek broad diversification, then lean our weightings in one direction or another based on our fundamental outlook for various regions. For several years after the crisis, we consciously underweighted Europe; austerity as well as the economies of Greece and several other “peripheral” EU nations held back Europe’s recovery relative to the U.S. Our clients in Europe have a different starting point for geographic equity weightings than those in the U.S. (investors typically use benchmarks that emphasize home markets, to align risk with their home economies and currencies), but across the board we recommended a tilt away from Europe and toward the U.S.
Then, after six years we regained a greater degree of optimism about Europe and began shifting assets back in that direction, as we noted in an article in 2017. Europe’s economic picture had improved markedly at the time, with debt crises fading into the rearview mirror and broader leading indicators such as purchasing manager sentiment heading in the right direction. Equity valuations in Europe at the time were more attractive than those in the U.S. These arguments still generally hold today in our view. We should note that at both ends of this decision-making spectrum, our shifts were incremental, not dramatic, and represented overall movements of 3-4% of our overall portfolio mix. We may look back in 12-18 months and see that our recent incremental shift toward Europe was slightly positive or negative. But we believe we will feel comfortable with our decision to remain invested globally, so we have the potential to capture opportunity and weather risk in a balanced manner. Russell 3000® Index is a market-capitalization-weighted equity index maintained by the FTSE Russell that provides exposure to the entire U.S. stock market. The index tracks the performance of the 3,000 largest U.S.-traded stocks which represent about 98% of all U.S incorporated equity securities. “FTSE®”, “Russell®”, “MTS®”, “FTSE TMX®” and “FTSE Russell” and other service marks and trademarks related to the FTSE or Russell indexes are trademarks of the London Stock Exchange Group companies. MSCI EAFE Index is a stock market index that is designed to measure the equity market performance of developed markets outside of the U.S. & Canada. It is maintained by MSCI Inc., a provider of investment decision support tools; the EAFE acronym stands for Europe, Australasia and Far East. MSCI All Country World Index Ex-U.S. (MSCI ACWI Ex-U.S.) is a market-capitalization-weighted index maintained by Morgan Stanley Capital International (MSCI) The MSCI All Country World Index Ex-U.S. includes both developed and emerging markets. BLOOMBERG, BLOOMBERG PROFESSIONAL, BLOOMBERG MARKETS, BLOOMBERG NEWS,BLOOMBERG ANYWHERE, BLOOMBERG TRADEBOOK, BLOOMBERG BONDTRADER, BLOOMBERG TELEVISION, BLOOMBERG RADIO, BLOOMBERG PRESS, BLOOMBERG.COM and BLOOMBERG LAW are trademarks and service marks of Bloomberg Finance L.P., a Delaware limited partnership, or its subsidiaries.